One Laptop Per Child (OLPC) showed off the next version of its famous laptops on Thursday at the International Consumer Electronics Show in Las Vegas, saying the new price-per laptop has been reduced to US$165 each and power consumption has been slashed by half compared to the previous version. The XO-1.75, with its 8.9-inch touchscreen, will start shipping in the second quarter of this year to countries around the world trying to bring schoolchildren into the computer age. OLPC was formed by professors at the Massachusetts Institute of Technology (MIT) to develop a low-cost laptop for kids in poor countries to help make sure nobody is left behind in the computer age. "The biggest obstacle has been power. We are pretty excited about getting a lower power laptop out there," said Edward McNierney, chief technology officer of OLPC, at a booth at CES. The XO-1.75 is the first OLPC laptop to use chips based on processor technology from Arm Holdings, which has been a huge factor in reducing power on the laptop, McNierney said. The previous XO used an x86-based microprocessor, the kind made by Intel, Advanced Micro Devices (AMD) and Via Technologies. Using Arm-based chips halved power consumption to just 2-watts, he said. 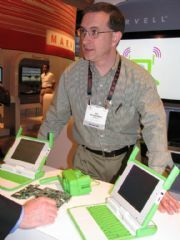 The upcoming OLPC tablet, the XO-3, will come out in 2012 and use just 1-watt of power, he said. The XO-1.75 laptop uses an 1GHz Armada 610 chip from Marvell Technology with Arm processing technology on board. The new laptop takes a major step into the tablet-era for OLPC, McNierney said. The group put the entire motherboard, which holds the chips and other components, behind the laptop screen, leaving the other half of the laptop for the keyboard and battery. The move simplifies the design so the next step can do away with the bottom half and end up with a tablet. The XO-3 tablet will have the same screen size as Apple's iPad, 9.7-inches, McNierney said. "It's gotta be a full-sized device," he said. OLPC also plans to make a cover to protect the tablet's screen. OLPC could put a soft, flat keyboard on the cover for easy typing and use a solar panel to solve the power issue. OLPC has learned from experience that finding electricity is the main problem in getting the XO laptops to kids in developing countries. Many areas lack electricity, making it hard to recharge laptops. The group has come up with a number of novel ways to recharge the laptop's batteries. McNierney recharged the XO-1.75 with a hand crank. It takes 1 hour and 47 minutes to fully recharge the battery by hand, he said. The battery is made with lithium ferrous phosphate, which he said is safer the lithium ion. The OLPC batteries are designed to last for five years and slow-recharging is one way to extend the life of the battery, he said.